I recently attended a half-day workshop on little-known aspects of the mythology of Saturn by Christopher Renstrom at the San Francisco NCGR. Renstrom's lectures (I've attended a few) tend to be meticulously researched, and full of fascinating and obscure historical minutiae related to the topic. A section of his workshop involved a short discussion of Ceres (daughter of Saturn/Cronos) and her association with, among other things, the loss of children. In response, I mentioned this chart involving the kidnapping of German children by their government last year. Ceres figures prominently in that chart. 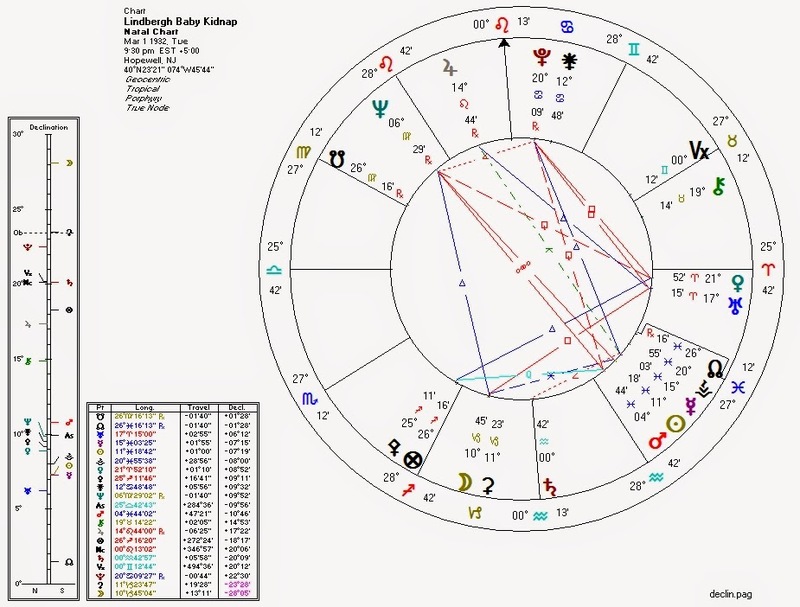 A fellow attendee and astrologer asked me afterwards if a similar pattern existed in the chart for the Lindbergh Baby kidnapping. I replied that I didn't know. It turns out that the answer is "yes". 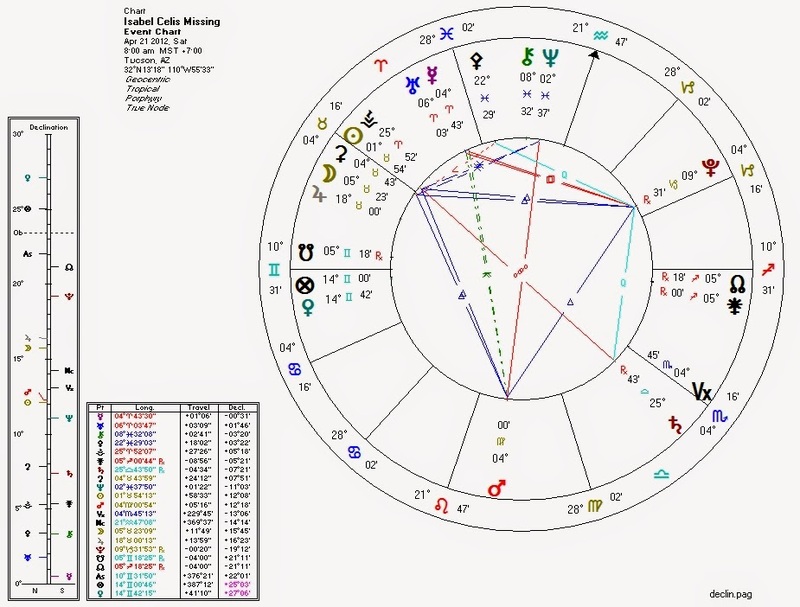 Ceres is, as in the German kidnap chart, conjunct the Moon. Ceres is not also conjunct the Sun as in the German chart, but is sextile the Sun. Venus on the Descendant, perhaps representing a loved one, is afflicted by Uranus (interruption), Neptune (disappearance), and Pluto (death). The Fifth House of children is packed with planets, but all of them are in Pisces, ruled by shadowy Neptune... which in turn is semisquare Pluto (again ruling death) in Cancer (death, as it were, of family). Pallas is square the Nodes, perhaps representing ethical struggle or confusion. Here, a Sun-Moon-Ceres triple conjunction, exactly as in the German chart. Note, also, the Pallas-Pluto quintile and Venus conjunction with the South Node. 1. Ceres with Moon and Sun. 3. Venus-Neptune (or South Node) connection or equivalent. Angel DiamondSeptember 22, 2014 at 10:40 PM You didn't notice the most obvious sign of kidnapping - Neptune opposes Mars (violent disappearance or violence in connection with hiding, sneaking around and deception). In both of the posted charts.